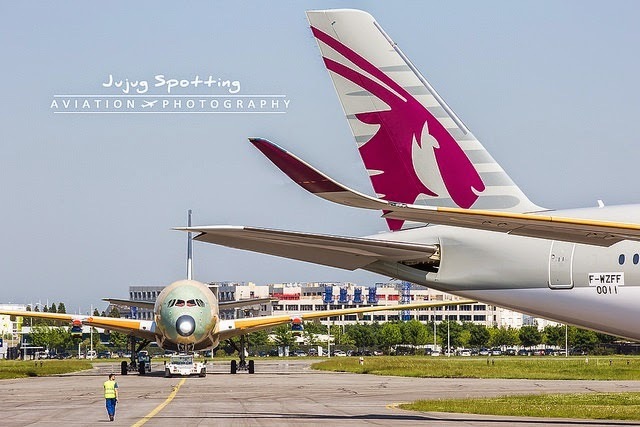 A350 XWB News: Airbus delivers the A350 MSN11 and MSN8 to Qatar Airways. Finally! 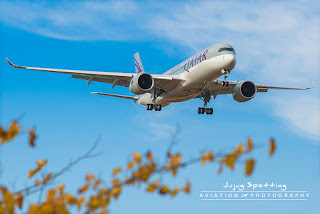 Airbus delivers the A350 MSN11 and MSN8 to Qatar Airways. Finally! 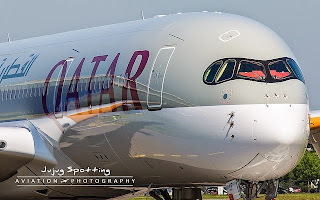 The last A350 delivered to Qatar was on 11/June (MSN10) and after more than 4 months without deliveries to the launch customer, finally today Airbus has delivered the MSN11 and MSN8 to Qatar Airways. These are the 5th and 6th aircraft delivered to Qatar Airways and the 9th and 10th A350 delivered to Customers. The MSN8, registered A7-ALE, was airborne on 9/July and it's delivery has been postponed several times in August, September and October. It has performed 11 flight test in July (4), August (1) and October (6). The MSN11, registered A7-ALF, was airborne on 28/August and it has performed 5 flight test. 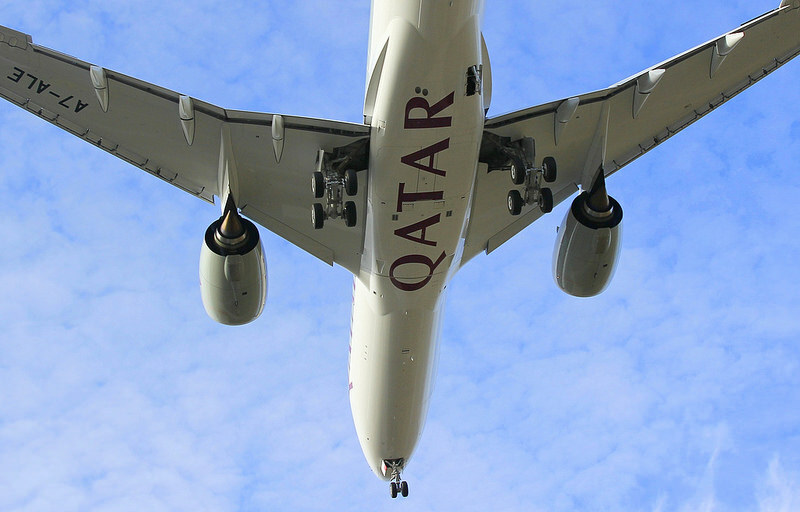 The reasons behind these delays have not been populated neither by Airbus nor by Qatar Airways. These two aircraft will allow Qatar to start on 1/Nov the Doha-Munich daily route. .Why the silence on MSN008? Makes one even more suspicious. Very odd,was it something really serious? Must have been or they would have said something before now,its been 3months since the first flight. AFAIK, the first A350 for Singapore Airlines was originally intended to be MSN008. Perhaps that's part of the reason for the delay. However, why are you being "suspicious" ? - 3 months, who cares? BTW, were you "suspicious" when Boeing rolled out an empty shell 787 on July 8, 2007 (7/8/7) - and Jim McNerney claimed it would "fly before the end of August". 1. Qatar was picky about some of the interiors or features. 2. There was something wrong with MSN008 and Qatar wouldn't accept the plane until it was fixed and Airbus could prove the problem didn't exist in MSN011. Seeing as Qatar didn't make any noise about it, I would say #1. The fact remains that MSN008, as reported, took a long time to deliver and all of us are sitting here wondering why. If this would have happened to Boeing (which it did), the press would have eaten them alive (and they did). Why does Airbus get such nice treatment? "Boeing's woes on the 787 are well known as they were well published." Nothing was ever admitted by Boeing before the last dump fib or direct lie was used to no avail. You shalt not rewrite history! This is just getting ridiculous. Airbus manager's have said that they'll deliver 15 A350s this year, and at least double that number next year. Why don't you just wait a few months to see if Airbus, in fact, will deliver 15 units - instead of posting FUD and conspiratorial drivel. If we were to talk about the 787 delays - where Boeing seemingly kept on announcing another delay "every other month", or so - Airbus, on the other hand, announced in October, 2006 that they would only deliver one A380 in 2007 (October). That was a pretty accurate announcement.They delivered only one A380 to SQ in October, 2007. Likewise, if Airbus will indeed deliver 15 A350s this year, they'll IMO have performed pretty much according to what was announced by the time of the first flight of the A350. Furthermore, where the press seemingly had started to lose confidence in the 787 only after multiple delay announcements, IMJ the press didn't refrain from pulling any punches on the A380 as soon as it became clear that the programme would be delayed. In this case, there seems to be no smoke and no fire, so the press has probably got better things to do than trying to disseminate a non-story. A7-ALF is now in Doha. A7-ALE is on its way. Anonymous, seems nothing Airbus does or doesn't do isn't a problem for you, I would have thought that as a supporter of Airbus any delay would be of concern but obviously not. Perhaps any critism of Airbus is not allowed in your book. I'm sorry, bit I'm not a "supporter of Airbus". I'm a supporter, though, of a football club (i.e. soccer). 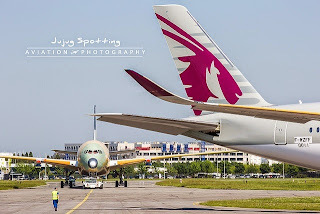 As for opinions related to the Airbus/Boeing duopoly, there's seemingly a phenomena occurring in that many of those who are criticising Airbus, typically resort to stating their opinions as facts - such as this quote from you in the last thread: "This problem for Airbus as been sitting there ever since they went their own sweet way with the A380. Which in itself was an ego trip-not a business case." As for criticising Airbus - no, I see no reason to criticise them on how they've executed the A350 programme, which BTW, is the topic in question. If we were, on the other hand, talking about the A380, it's obviously not very difficult finding flaws on how that programme was executed. BTW, that has got nothing to do with the original business case for the programme - something you apparently believe was an "ego trip" (LOL). So, trying to find "anything" that could indicate that there's a problem with the ramp-up of A350 Production - or anything else - is really nothing but pathetic. Airbus managers have pointed out, again and again, that the ramp-up is challenging, and there's obviously no guarantee that they'll reach the scheduled ramp-up targets on time. IMO, however, they seem to be making good progress. Hence, there's little point in trying to muddy the waters - unless, of course, that you have some sort of an agenda. I see warning sings that that ramp-up may not be going as planned. Yes, ramp-up is very, very hard. If Airbus were to miss their 15-airplane delivery goal for 2015 by one or two airplanes, it wouldn't be the end of the world. Since you are a (proper) football fan, I'll give an analogy. It's minute 75 and your favorite team is down 3-1. A team's strategy is usually not falling behind and catching up in the final minutes of the game. That's why we are nervous. Airbus has delivered 9 A350's out of the 15 they set out to delivery this year. Another 4 airplanes have already come out of final assembly. Since it has taken at least 6 weeks for an aircraft to be delivered after it comes out of final assembly, 2 more aircraft will have to come out of the factory in the next 2 to 3 weeks in order to have a chance at reaching the low-end of their goal. There's only 15 minutes left in the game. We'll know soon enough if they'll be able to pull off a victory. That's a pretty questionable analogy that you've got there. It might have been more accurate if you'd directed it against the 787 some five years ago - after the programme was grounded in November, 2010, thanks to the electrical fire in the control panel aboard one of the test planes. A more accurate analogy for the A350 would IMO be; 2-1 up in the 91st minute and 4 minutes to go in injury time. If that was really meat to be a SIA Frame, that it was definitely a challenge... Why was that changed? AFAIK, SQ was only going to receive one copy from batch 2. When 40 percent of cabin parts would be different on their second aircraft, I'd guess that they decided it made more sense to wait for batch 3 aircraft. "Airbus plans to introduce the A350 in several batches, each of which will incorporate changes, with the most significant modifications made in the transition from Batch 2 to 3. The changes affect parts and components throughout the aircraft, and suppliers have been given detailed design targets that specify the amount of weight reduction needed, among other things. Batch 1 will include all the flight-test aircraft and early production versions, including MSN4, industry officials say. The first round of relatively minor design changes will be incorporated with MSN5. The more fundamental upgrade will happen with MSN17, say two executives with knowledge of the matter. Airbus has not revealed the exact points of transition, but Andreas Fehring, A350 senior vice president, head of fuselage and cabin, confirms that Airbus has decided to incorporate the A350 changes by batches. Airbus has already powered up the cockpit of the first A350, but a lot of modification work is still needed. The A350's cabin is one major area in which upgrades are going to be made. From MSN17 on, 40% of cabin parts will be changed, industry officials say. 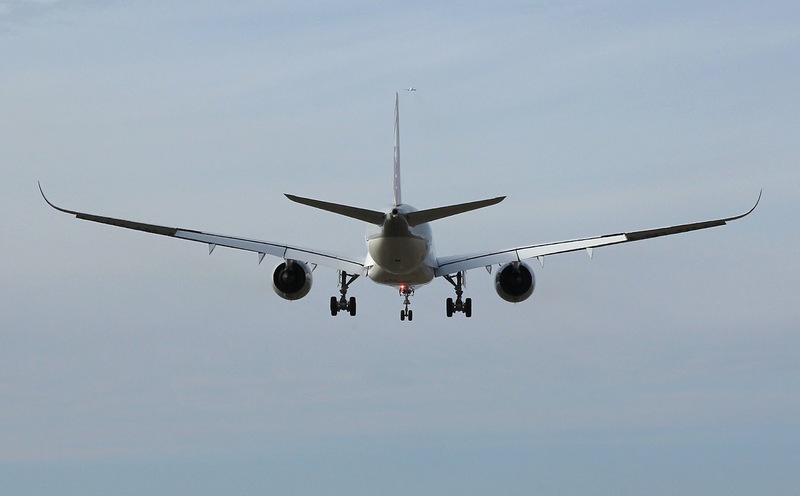 Airbus neither confirms nor denies that figure. The redesign includes cabin bracketing—the way the interior is attached to the fuselage—and the air-conditioning system, as well as other interior components."